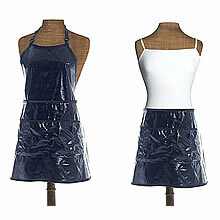 Be the envy of everyone else in your salon with this Fold Down Convertible Apron from Fromm 1907. The extremely professional design will not only give you comfort but also protection from harsh, potentially staining, chemicals. Unique 2-in-1 design. The apron converts to a tool skirt.